The purpose of this experiment was to determine the effect of motor oil on the survival rate of brine shrimp. I first became interested in this idea because I had heard horrible reports, over and over, from watching the news about the pollutants getting in our lakes, rivers, seas, and oceans that damage the aquatic life. I wanted to see for myself how a common pollutant would affect an organism. I chose to test on brine shrimp because they are at the bottom of the food chain. If the motor oil killed them then the whole food chain itself would collapse. The information gained from this experiment could warn anyone who owns a car how much the motor oil that they dispose of could affect the population of living creatures in our waters. Oil must be disposed of correctly. Pollutants add up in the environment, so my results would help us in the future. My first hypothesis was that as the amount of motor oil in the water increased the survival rate of the brine shrimp would decrease. My second hypothesis was that the more motor oil there was in the water the shorter time the brine shrimp would survive. The manipulated variable was the amount of motor oil put in each Petri dish. 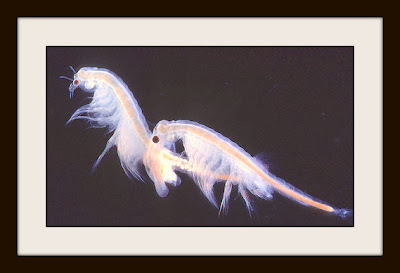 The responding variable was the rate of the deaths of the tested brine shrimp. To measure the responding variable, I counted how many brine shrimp survived in each petri dish about every 10 min. for a period of 1 hour. 2. Culture brine shrimp at 20ο C.
The original purpose of this experiment was to determine the effect of motor oil on the survival rate of brine shrimp. The average results of the experiment were that the brine shrimp that were held in the petri dish with 5% motor oil only had 85% living after 1 hour. The brine shrimp that where being held in the petri dish with 10% motor oil only had 83% living after 1 hour. The brine shrimp that were being held in the petri dish with 20% motor only had 76% living after 1 hour. The brine shrimp that were being held in the petri dish with 40% motor oil only had 76% living after 1 hour. The control group with no oil had 98% living after 1 hour. The results indicate that my first hypothesis should be accepted, because having the motor oil increase did have the survival rate of brine shrimp decrease. The results indicate that my second hypothesis should be accepted, because the more motor oil there was in the water the shorter time the brine shrimp would survive. After thinking about the results of this experiment, I wonder if antifreeze would decrease the survival rate of brine shrimp even more than the motor oil did. Antiifreeze is soluable in water and motor oil is not. I also wonder if I used water from a different water source the results would change. If I were to conduct this project again I would probably add more motor oil in with the brine shrimp to get bigger results.